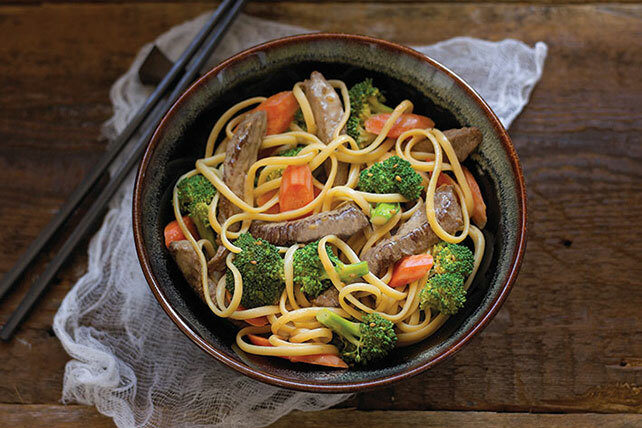 Have a bowl of deliciousness at dinnertime tonight with our Beef Noodle Bowl recipe! Enjoy our Healthy Living noodle bowl with veggies in just 30 minutes. For added crunch, sprinkle with 1/2 cup PLANTERS Dry Roasted Peanuts just before serving. Prepare as directed, using KRAFT Zesty Italian Dressing, adding 1 tsp. ground ginger and increasing the teriyaki sauce to 1/4 cup.